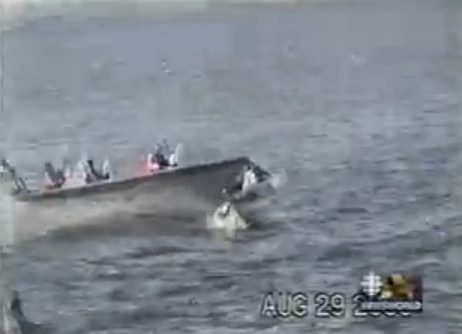 Department of Fisheries and Oceans patrol boat running over Mi'kmaq fishers in 2001. 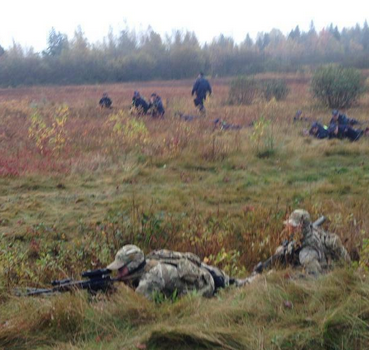 "NB protest turns violent," a CBC headline solemnly proclaims. 1,280 news stories about anti-fracking protests in Rexton, New Brunwick, indexed by Google use the word "clashes." Most stories are decorated with photos of burning police cars. All this points to one thing: the way that Canada's corporate media discusses Indigenous protests is fundamentally broken. Let's put it this way. If a hockey player gets in a fight or takes a boarding penalty, we can count on the intrepid investigative team at Hockey Night in Canada to find the footage, if it exists, of the "victimized" player instigating the conflict by making a nasty play when the ref wasn't looking. When it comes to Mi'kmaq traditional territory, the stakes are infinitely higher, but the effort reporters put in falls short of a typical Don Cherry segment. Most of the reporters currently flocking to rural New Brunswick can't be bothered to crack one of hundreds of history books that might give them the background they need to understand the situation. In fact, they're not even interested in the months of peaceful protests which "turned violent" when the Royal Canadian Mounted Police (RCMP) brought in snipers dressed in camouflage and armoured riot police who attacked protesters with pepper spray, physically assaulting those who stood in the way of violations of treaty rights and the destruction of their land. The corporate media's interest in the issue seems to have coincided with the exact moment when unprotected police cars were set on fire (by whom, we have no idea), and their curiosity does not extend back from the present moment. Reporters and editors seem happy to allow the racist anti-Native narratives, which are themselves hundreds of years in the making, to fill in the blanks for their readers and viewers. Are we to understand that reality and accurate understanding is what reporters are supposed to provide? If so, it's worth telling them that the situation in New Brunswick is impossible to understand without a bit of history. In the mid-1700s, the Crown signed Peace and Friendship treaties with the Mi'kmaq. The Crown -- the entity that puts the "Royal" in "Royal Canadian Mounted Police" -- understood that to maintain their settlements on someone else's traditional territory without worrying about attacks, they needed a treaty relationship with the folks who live here. Oops, that wasn't the warrior society. It's actually what the Canadian government said about the treaty. It's what they have to say, because a long string of court decisions has upheld that the Mi'kmaq nation holds collective rights to the land they share with European settlers. Let's put this another way. If the British hadn't signed a treaty that acknowledged the rights of the Mi'kmaq to the land, British, Scottish and Irish settlement (as well as subsequent waves of migration) might have either not happened at all, or happened in a totally different way. All those who live on the land governed by the treaty are bound by that relationship, by law and by history. That, at any rate, is how many Mi'kmaq people see it. Non-Native Canadians are more likely to know nothing about the relationship that allows them to live in parts of New Brunswick or Nova Scotia. If they do know, they probably see it as a social studies curiosity rather than the basis of their legal rights in this country. And that's where the media comes in. People who have been reading newspapers and listening to CBC News on the radio for years still have no idea about what should be the most basic self-awareness. It's hard to say why any given reporter or editor chooses to continue not providing this essential information. But we can identify the effects of this ongoing neglect. In the early 1800s, Mi'kmaq people were forced onto reserves. Then the colonial government made a law which allowed European squatters to claim ownership over lands set aside for Mi'kmaq. During this time, Mi'kmaq status was taken away from anyone who decides to become Canadian (necessary at the time to gain voting and other rights). In the 1900s, Mi'kmaq settlements were encroached upon continuously, with many imposed relocations. The Canadian government forced children into residential schools starting in 1930, followed by "centralization," which again forced Mi'kmaq families to move into two reserves (Shubenacadie and Eskasoni). Many resisted the move, and the government was only able to centralize about half of the Mi'kmaq population. It was only in 1951 that a ban on traditional ceremonies was lifted. 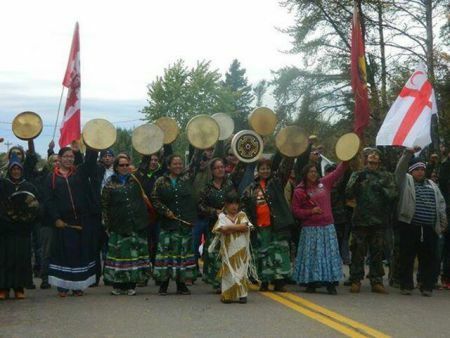 When Mi'kmaq people stop fracking trucks from entering their territory, they're defending land that they never gave up. Land which the Supreme Court says they have rights to, rights which the government continues to prevent them from acting on. The growing list of solidarity actions speaks to a different way of doing things, but ongoing widespread ignorance of the actual situation is what makes this violence possible. It's far beyond time for the corporate media to stop talking about clashes, and start talking about reality.